In an Oracle Real Application Clusters (RAC) environment, all the instances or servers communicate with each other using high-speed interconnects on the private network. If the instance members in a RAC fail to ping or to connect to one other via this private interconnect, all the servers that are physically up and running (and the database instances on those servers) might end up in a condition known as split-brain. In an Oracle cluster (prior to the Oracle RAC 12c Release 2 version), when a split-brain problem occurred due to network or disk issues, the node with lowest node-number survived in the cluster. However, with the latest Oracle RAC 12c Release 2, there has been a change in the algorithm by which the candidate nodes to be evicted are chosen for the specific case where the split-brain results in the creation of an equal number of nodes in the sub-cluster. This blog post covers the changes to the node eviction algorithm in Oracle RAC 12c Release 2 based on the new node-weighting feature. The following image illustrates the node-weighting alorithm. 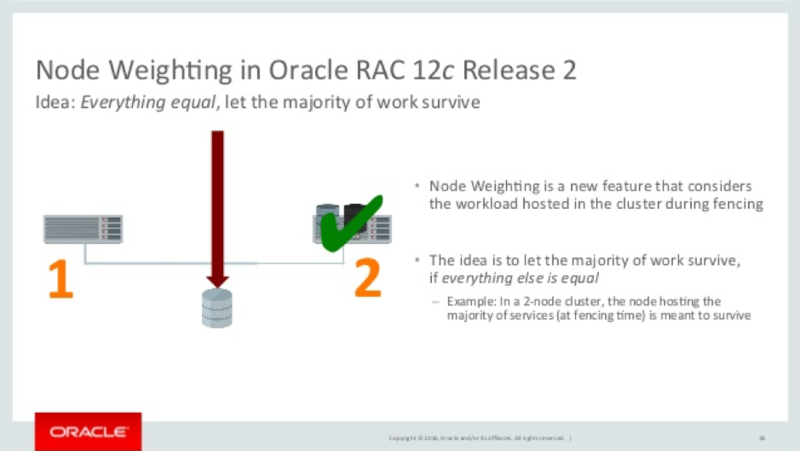 Node Weighting is a new feature introduced with Oracle RAC 12c Release 2 that considers the workload hosted in a cluster during fencing. When a split-brain situation occurs, Oracle Clusterware applies certain rules to select the surviving cohort, and the system might evict a node that is running with critical resources. Using this new feature, we can assign weight to certain nodes and save the node from getting terminated from cluster. A newly created tag, CSS\_CRITICAL, can be set on various levels or components to mark them as “critical” so that the cluster tries to preserve them in case of a failure. When Oracle Clusterware makes a decision about which node to evict in the case of a split brain, the CSS_CRITICAL tag is honored as long as no other technical reason prohibits survival of the node (where the node has at least one critical component at the time of failure). The concept allows majority of the work to remain unaffected, if everything else is equal. Assigns weight to database instances or services. We can set the -css_critical to yes with the srvctl add database or srvctl add service commands when we add a database instance or service. We can also set or change the parameter with the srvctl modify database and srvctl modify service commands. Assigns weight to non ora. * resources. We use the -attr CSS_CRITICAL=yes parameter with the crsctl add resource and crsctl modify resource commands when we add or modify resources. Assigns weight to a server. we set the -css_critical parameter to yes with the crsctl set server command. Which node has the maximum number of services created? Are singleton services created for the instance? Is the node a configured Flex ASM instance? Was there a public network failure? What type is the node - hub or leaf? The following code walk-through examines a case where bond2 is used as a private interconnect for a two-node cluster. CRS-5092: Current value of the server attribute CSS_CRITICAL is yes. If the sub-clusters are of the different sizes, the functionality is same as in previous releases. If the sub-clusters have equal node weights, the sub-cluster with the lowest node number survives to ensure that, in a two-node cluster, the node with the lowest node number survives. If the sub-clusters have unequal node weights, the sub-cluster having the higher weight survives to ensure that, in a two-node cluster, the node with the lowest node number gets evicted due to the lower weight. Using server weight-based node eviction, we gain more control over the Oracle Clusterware failure recovery mechanism by selecting which cluster nodes should be terminated or evicted in the event of a split brain. If you have any questions or need guidance on this topic, you can add comments in the field below.